Falansai is honored to be included in the Michelin Guide New York Bib Gourmand in 2019 for the fourth year in the row. 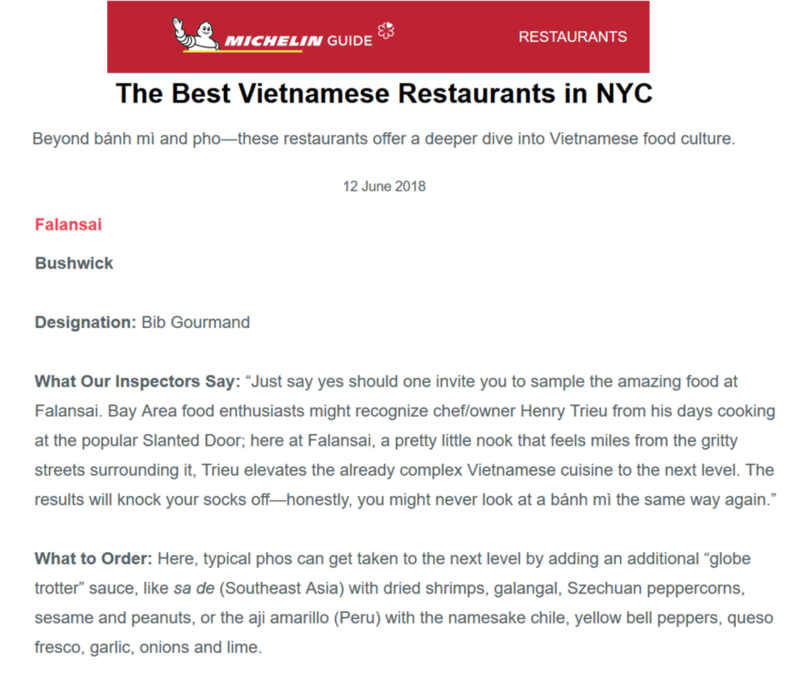 The Michelin Guide also lauded Falansai as one of the best Vietnamese restaurants in New York City. Eater and Thrillist rated Falansai among the best Vietnamese restaurants in New York. The Culture Trip rated Falansai among the top restaurants in Bushwick. Zagat lauded Falansai’s Catfish Claypot as one of the ten Vietnamese Dishes you need to know. New York Magazine included Falansai in the Best 1000 Restaurants in New York City. Falansai’s Chef Henry Trieu was among the New York Culinary Talent selected to be part of the inaugural Martha Stewart Wine and Food Experience New York City hosted by USA Today. Watch the ABC7 New York Neighborhood Eats segment on Falansai by clicking here and listen to Henry Trieu’s conversation on Food Without Borders on Heritage Radio here. You can now try preparing Falansai’s Catfish Claypot at home with Chef Henry Trieu’s recipe in the USA Today Wine and Food Experience Cookbook 2018.